Colostrum is yellowish-colored thick sticky milk that is low in fat, high in carbohydrate, proteins and antibodies. It's been the perfect first food for the child since ages and its volume can be calculated in teaspoons. Colostrum has laxative effects and this helps the baby pass stools easily. This supports proper excretion and prevents an overload of bilirubin which in turn, helps prevent jaundice. Colostrum contains large amounts of antibodies called secretory immunoglobulin A (IgA). IgA protects the baby from germs in the throat, lungs, and intestines. Leukocytes, a protective white cell which would destroy disease-causing bacteria and viruses are present in higher amounts in the colostrum, and hence protect the baby from infections. • Breast milk reduces diarrheal disease due to its anti-diarrheal property. • Eczema, an allergic reaction, is significantly rarer in breast-fed babies. • Breast feeding reduces the incidence of lower respiratory tract infections. • Breast milk has properties that help to avoid a host of diseases like diabetes, hypertension, and obesity in the later part of life. • The immune factor IgA present only in breast milk protects the baby from developing any kind of allergies. IgA forms a layer in the stomach - gastro intestinal tract passage which prevents the action and proliferation of bacteria. 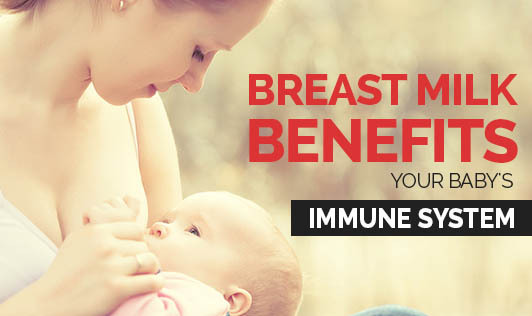 • Breast feeding may also decrease the risk of cancer in the child in the later part of life.